Gardeners in North America either love bittersweet vines or hate them. Bittersweet plants can kill trees and are difficult to eradicate from your landscape. But during the fall season, the vines put on a display few other plants can rival, as the deep yellow skin of their berries bursts to reveal an orange jewel within. And not to be outdone by the berry, the plant's fall foliage blankets its victims in yellow splendor. To grow bittersweet vines or not to grow them: truly a bittersweet decision for landscapers. But exactly what plant are we talking about? There are two dioecious vines with yellow and orange berries commonly called "bittersweet." They look very much alike. One, an innocuous vine indigenous to North America with smooth stems, is Celastrus scandens, also called "American bittersweet" plant or "false bittersweet." The other, an exotic vine that is among North America's most invasive plants and whose stem bears blunt thorns, is Celastrus orbiculatus, or "oriental bittersweet" vine. Another way to distinguish between American and oriental types is by discerning the location of their berries: the berries of American bittersweet plants appear at the tips of the vines only, while those of the oriental type grow along the vine. But the biggest distinction between the two is in terms of their environmental impact. For while oriental bittersweet vines are considered an environmental menace by many, American bittersweet plant is becoming so rare in some areas that it is now a protected species. It is the oriental kind that threatens to kill your trees; while American bittersweet plants are themselves threatened. Where Do Bittersweet Plants Grow? According to the USDA Natural Resources Conservation Service, American bittersweet plants occur naturally in the central and eastern U.S., except in Florida. Meanwhile, according to the U.S. National Park Service, oriental bittersweet vines are native to eastern Asia; they were introduced into the U.S. in the 1860s. Reporting on the spread of the oriental variety in the U.S., the Park Service says that it occurs "from New York to North Carolina, and westward to Illinois." It is more enticing to birds (which, in turn, disperse the seeds after eating the berries), because its berries are a brighter red color (it also produces more berries). Its seeds germinate at a higher rate. It is better at photosynthesizing. The powerfully invasive oriental type engulfs other vegetation, slowly killing it. The germination of a bittersweet seed in the ground at the base of a tree seems harmless enough. Yet, it won't take long for the oriental bittersweet vine to make it to the tree's crown, a la Jack's beanstalk made famous in folklore. It can be difficult to imagine a vine killing a tree, but oriental bittersweet vines have slain many a giant. Capable of reaching four inches in diameter, oriental bittersweet vines wrap so tightly around their victims that the trees are strangled, in a process called girdling by arborists. Even when they aren't strangling a plant, they envelop it in so much shadow that they rob the plant of the sunlight required for proper photosynthesis. Conservation New England reports that, in the case of smaller trees, uprooting can even occur, as the trees' root systems are unable to contend with the massive weight of entrenched vines. But you may be wondering at this point, "If American bittersweet plant is also dubbed 'false bittersweet,' then is there a 'true bittersweet'?" The answer is yes, but the true bittersweet is not represented by the oriental type, either. To discuss the plant properly called "bittersweet," we'll have to introduce a third plant into the linguistic fray. For the true "bittersweet" is a plant markedly distinct from both oriental bittersweet vines and their rivals native to North America. What's in a name? Shakespeare asked the question vis-a-vis the rose. But unlike the rose, bittersweet has earned its name. It is tempting to think that the name originated from the dual nature of the vine: namely, the fact that it is so destructive (in the case of Celastrus orbiculatus, not Celastrus scandens), yet so beautiful. But alas, the explanation is hardly so poetic. And before revealing the derivation of the name, it is necessary to introduce yet another character into this "Comedy of Errors," a plant in the infamous nightshade family—bittersweet nightshade (Solanum dulcamara). If neither of the two types of bittersweet vine known so well in the eastern and central U.S. is the true "bittersweet," then what plant merits that appellation? The answer: a noxious weed introduced into the U.S. from Europe, called "bittersweet nightshade" (Solanum dulcamara). 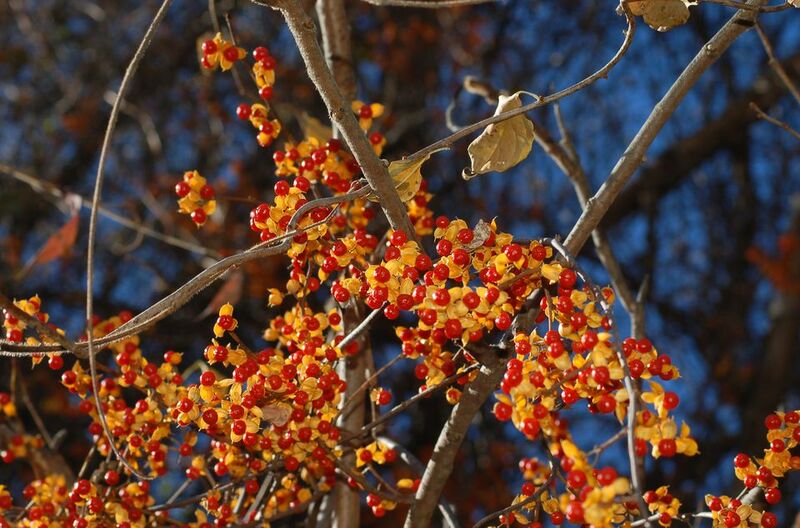 The colorful berries of this plant undergo an interesting transformation during their growing season. Beginning as a green berry, they change first to a yellow color, then to orange, and finally mature to red. Making the plant even more colorful is the fact that not all the berries reach these color stages at the same time. Consequently, it is not uncommon to see a bittersweet nightshade plant bearing berries of three or four different colors. The berry of this true bittersweet is poisonous (as are several other enticing wild berries I frequently encounter in New England, including baneberry). Not that I'd recommend that the novice ingest false bittersweet berries or oriental bittersweet berries, either. Commenting on the berries of Celastrus scandens, the experts at Moonshine Designs quip, "While not extremely toxic, they will 'clean you out at both ends'." In fact, it's sound policy never to eat any part of any plant with which you are not intimately familiar; if you have a yearning to become the next Euell Gibbons, first study what the experts have said about it (I am not an expert in this area). Interestingly, both Celastrus scandens and bittersweet nightshade (Solanum dulcamara) were used for medicinal purposes by herbalists in the U.S. in the nineteenth century. In the case of Celastrus scandens, the bark was gathered by herbalists; while it was the twigs of the bittersweet nightshade that were prized. King's American Dispensatory (1898) indicates that one of the herbal uses both of bittersweet nightshade and of Celastrus scandens, or false bittersweet, was as a diuretic (a substance that increases the flow of urine). And the derivation of the name, "bittersweet"? King's American Dispensatory has the following to say of the twigs of bittersweet nightshade: "their taste is bitter, followed by some sweetness and a slight acridity." The same source reveals how Celastrus scandens came to be thought of as bitter-sweet, remarking that "The bark has a bitter, afterward sweetish, rather nauseous taste." So if they both have a bitter-sweet taste, why is bittersweet nightshade (Solanum dulcamara) considered to be the true "bittersweet," while Celastrus scandens had to settle for "false bittersweet"? Well, by the time the European plant classifiers discovered the properties of Celastrus scandens, the name "bittersweet" had probably already been claimed by bittersweet nightshade (as a European plant, Europeans knew of it at an earlier date). As for Celastrus orbiculatus, since "bittersweet" and "false bittersweet" had already been used as names for other plants, the solution arrived at for a common name was to name it after its place of origin -- the Orient. Note that the common name and the botanical name mirror each other exactly in the case of bittersweet nightshade (Solanum dulcamara), which is not always the case in plant nomenclature. Solanum is the part that indicates "nightshade," while dulcamara is a composite of two Latin words -- meaning "sweet" and "bitter," respectively. The only difference between the two languages is the order since the Latin would translate literally as "nightshade sweet-bitter." So as you can see, when somebody starts talking about "bittersweet," the conversation is hopelessly vague: the common name just doesn't give you sufficient information for discussion. The confusion to which I've pointed above provides a poignant example of why we use scientific names of plants. What camp are you in when it comes to landscaping with Oriental bittersweet? Is it a pest? Or is it too pretty to be considered a pest? Birdwatchers have come to appreciate bittersweet berries as an emergency food source for birds in the winter, including Eastern bluebirds. Both Oriental and false bittersweet are similar to sumac in this respect. All three plants are useful for attracting Eastern bluebirds to your landscape for birdwatching. My sumac article provides information on sumac's uses, history, and characteristics. Arts and crafts folks have also fallen in love with bittersweet (whether Oriental or false). Bittersweet vine can be used, in and of itself, to construct a fall wreath. In addition, smaller portions of vine laden with berries are often incorporated into wreaths composed primarily of other materials. Stewards of the landscape in the U.S., however, are keeping a close eye on Oriental bittersweet vine. Along with other exotic plants such as purple loosestrife and Japanese knotweed, Oriental bittersweet vine is one of the terribly invasive plants considered by many to be an environmental menace. Oriental bittersweet vines choke out native plants, replacing them with a monoculture. Exacerbating the problem is the fact that, invasive plants or not, bittersweet's vines are so captivating that they entice people to propagate them as a landscaping element. As if Oriental bittersweet vines needed any help in spreading! But What If Oriental Bittersweet Is Already Too High to Spray? The instructions above are useful if you have caught the problem in time: namely, before Oriental bittersweet has climbed your trees (to any great height, at least). But what if the problem is already out of hand? Well, not all is lost. If the invasive vine has carried its invasion into the canopies of the trees, the vine's trunk is probably quite thick. That's the bad news. The good news is that the bittersweet vegetation growing in the canopy is depending upon that trunk: its water supply must come from the roots underground, up through the trunk, and thence to the arboreal vegetation. Sever the connection by cutting through the trunk, and you cut off its water supply. But don't stop there. Immediately after cutting the trunk, daub some herbicide onto the top of the stump that remains. It will be drawn down to the roots, hopefully killing them. nor is it an invasive plant. unrelated to the two other "bittersweets"
If the charms of Oriental bittersweet lure you into growing it on your property, at least take precautions against the spread of this highly invasive plant. Keep it confined to one area of your property by ruthlessly suppressing infestations elsewhere. Where you are allowing it to grow, visit often with your pruner; with proper attention, it is possible to tame Oriental bittersweet, restricting it to bush status. And if you are going to train it to grow vertically, construct a large trellis, or tie the vines to a fence. Do not allow Oriental bittersweet to grow on any tree whose health you value. How Well Do You Understand Botanical Plant Names? How Do Identify Poison Ivy, Sumac, and Oak?